Another addition to my Italian collection. "Audace" - destroyer of the Cold war. 1:350 scale. The "Audace" class destroyers were two guided missile destroyers built for the Italian Navy during the Cold War. 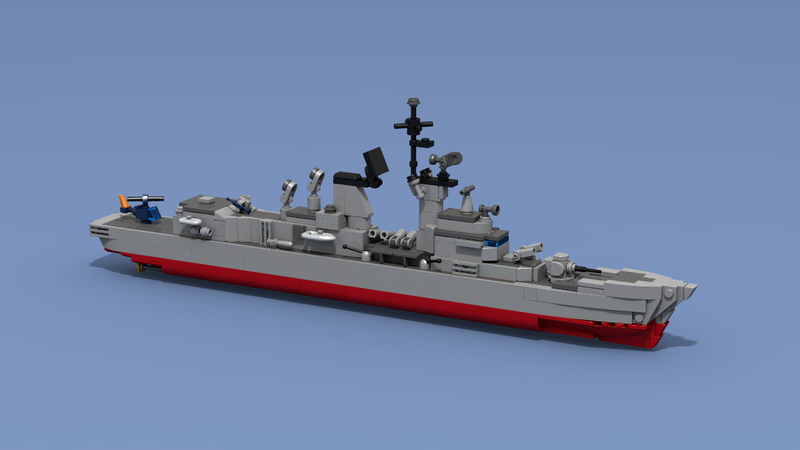 An improvement of the "Impavido" class, these ships were designed for area air defence and also had a heavy gun armament. They were fitted with contemporary American radars and sonars, but also, as the next Italian ships, all the modern weapons made by Italian industry of the time, such torpedoes, helicopters and guns. For its relatively small displacement, these ships were very seriously armed-SAM "Tartar", six automatic guns of 127 and 76 mm, torpedo tubes 533 and 324 mm, as well as two anti-submarine helicopters AB-212ASW. In 1988-1989 they underwent extensive modernisations: it included the replacement of one 127 mm gun turrets and also the A.184 533-mm torpedoes with new weapons: a "Teseo" SSM system (midship, between the 76mm guns) and an eight-cell "Albatros Aspide" SAM launcher (directly replacing the 127mm turret). The four 76/62 mm guns remained, but the "Compact" model was replaced by 76/62 "Super Rapido" (120 rpm, meant especially for anti-ship missile defence). The "Tartar" SAM complex was replaced by the RIM-66 "Standard Missile" SM-1 system. So, with this new systems, these ships were able to cope with all the requirements: thanks to the "Supe Rapido" and "Albatros" they had a much improved close-defence, especially against missiles, while "OTOMAT" allowed a long range, anti-ship capability, together with AB-212 for targeting over the horizon. 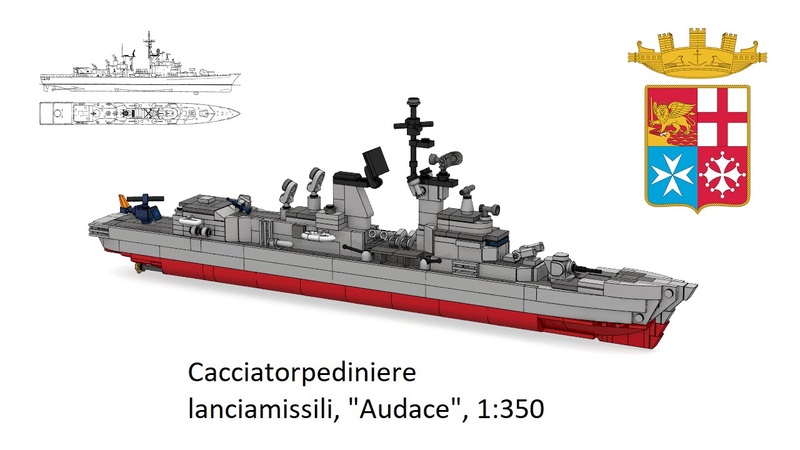 All this helped to bring these ships almost to the same level of the new "de La Penne" class, in 1991 still under construction, with even more weaponry (1 "Super Rapido" gun). 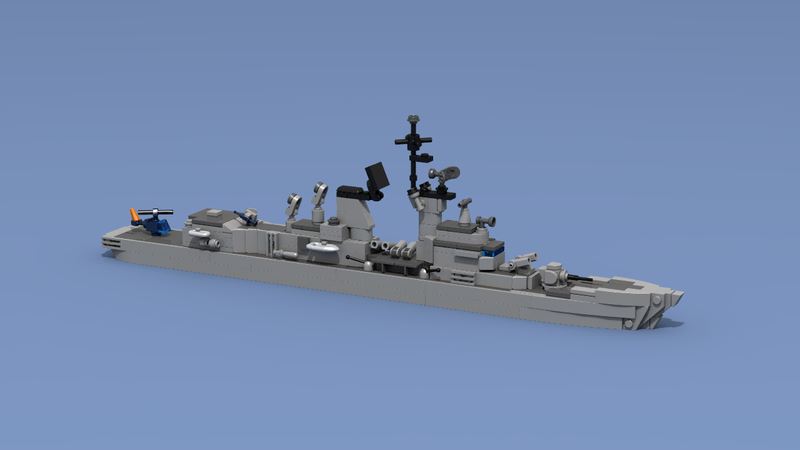 My model is built in the scale of 1: 350, for the construction took 545 (445) bricks. Quoting Kurt's MOCs Great work, Seaman! Great details, especially on the radars and mast. You have to make a major NATO port facility for all your Cold War ships. I think Gibraltar would be awesome, rock and all! Thank You, Kurt! Good idea! I'm gonna go look for a photo of Gibraltar. Only on a scale of 1:350 diarama will be too large... I was going to build at 1: 700. Great work, Seaman! Great details, especially on the radars and mast. You have to make a major NATO port facility for all your Cold War ships. I think Gibraltar would be awesome, rock and all! Quoting Clayton Marchetti Love the radar mast . Beautiful job! Love the radar mast . Beautiful job!